Do you dream in full color? I dreamt I spotted the most beautiful woodpecker, and in my dream I noted that it was in gorgeous golds, ochres and siennas. The woodpecker, aside from it’s unique coloroing, looked just like the California Stellar Jays I see in my neighborhood, complete with peanut in mouth and nothing like a woodpecker. (Not that I’ve ever seen a woodpecker, although I have heard them). 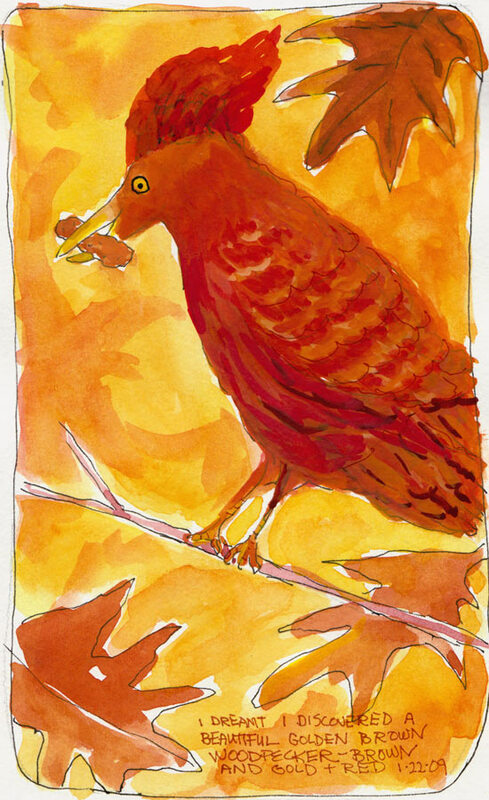 Then I spotted another beautiful bird with, as I noted in the dream, a lime-colored Mohawk. Actually, in the dream I think I called it a “faux-hawk” because there’s something about the way”faux-hawk” sounds that pleases me. This bird made horrible Peacock noises. The next dream carried on with the odd colored top-knot theme. 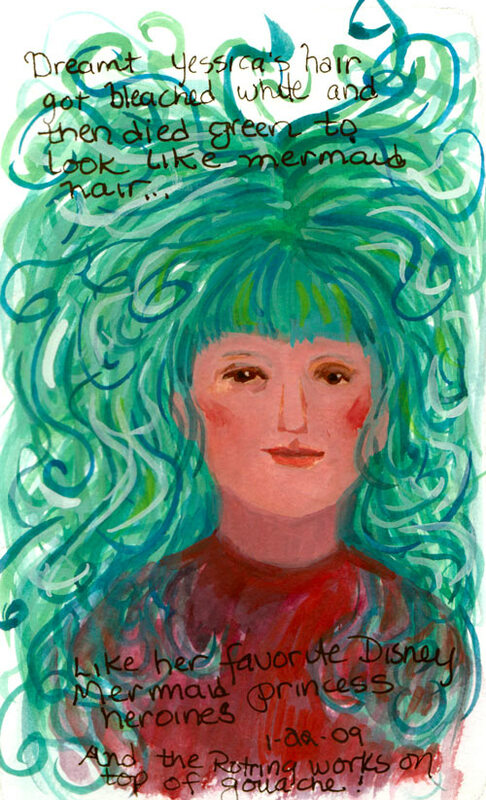 The long, black, silky, beautiful, Latina hair of the girl next door had been bleached white and then died mint green so she’d look more like the Disney mermaid princesses she seems to like so much. These were all done with gouache in the large Moleskine watercolor notebook. Yes, we have a bird theme today although your birds came when you were sleeping and I see my clay ones while awake. Love the wordplay of the lime faux hawk. (Lisa had one of those once although it was orange, not lime.) I envy your memory of your vivid dreams and thank you for sharing them. When I have been dreaming in that hyper-dream color, I wake up happy even if I don’t remember the content or “story” of the dream. I like waking up happy after good dreams too. One morning last week I woke myself up laughing about something funny in my dream but I don’t remember what it is now. How appropriate that an artist dreams in vivid color. 🙂 What is moleskine? I like your woodpecker. We have woods behind our house and a few times I’ve seen a red-headed woodpecker. So striking, they look like they’re wearing a bright red hood! Yesterday, we saw a hawk! That was exciting. I’m glad I found your blog. You have the best dreams! No wonder you’re an artist. I love your colorful dream visitors! Beautiful colors always make me feel good when I awake and I’ve usually slept restfully. The most colorful dream I’ve had…I was on an enormous sailing vessel with the wind blowing in my face, looking at the vivid blues, greens and turquoise of the ocean. I love it that you record your dreams in your sketchbook! That is a wonderful dream! It sounds like it would be fun to paint! 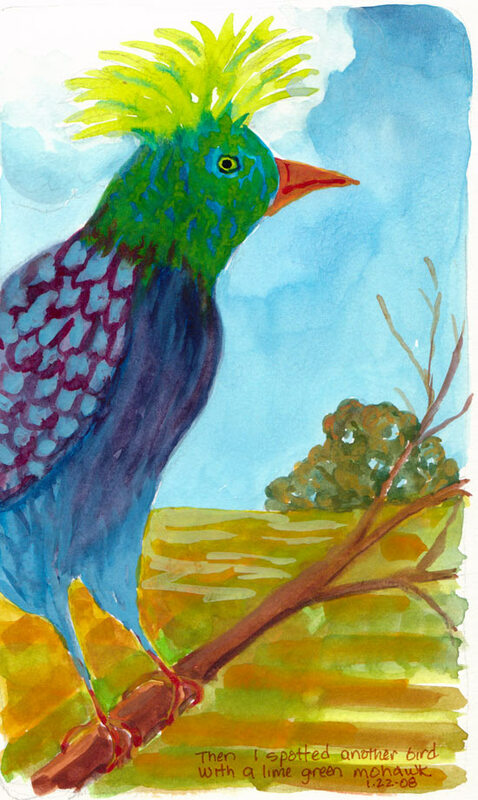 I love the bird paintings. Remembering dreams – what a good idea. Like Chagall, that quality of strangeness. I once dreamed that I walked through a house (in colour) into a back garden that was black and white with everything like an old-fashioned engraving. I wrote a short story about it. What vibrant colors! Looking at your paintings leaves a feel-good factor behind. They are beautiful.